SPECS has been delivering highly specialized insurance consulting services throughout Canada for the past 20 years. Services include structural and content appraisals, acceleration of insurance claim processes, and construction cost control. SPECS chose to work with LyntonWeb based on a referral from a LyntonWeb team member who had previously worked with the Canadian insurance consulting firm. SPECS was looking to update the look, feel, content and branding elements of its site, with the addition of new service offerings to appeal to three new target audiences. It also wanted to increase its traffic, lead generation and lead conversion rates. 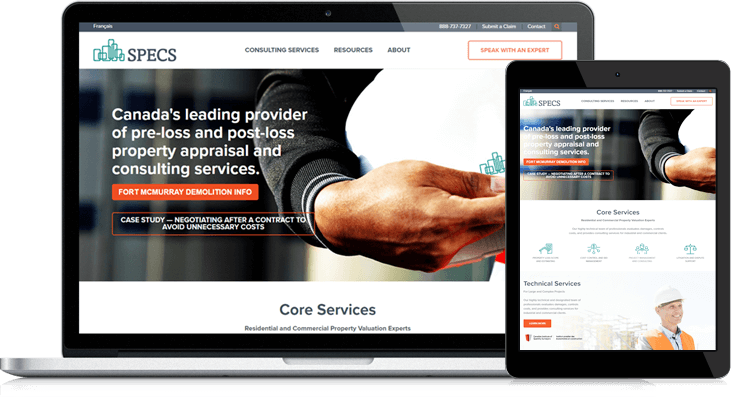 LyntonWeb worked with SPECS team members to collaborate on content strategy, then incorporated new branding elements and content into the site’s redesign on the HubSpot platform. The entire site received a facelift, with a streamlined layout, branding elements added to various modules, individual service pages, and new templates designed to support fresh content. LW worked with SPECS to develop a content strategy that would appeal to all four of the company’s target audiences. We expanded the content’s reach even further by translating all the web pages and adding a menu button that allowed visitors to easily switch between English and French. The new site is likewise equipped with noticeable buttons so visitors can quickly Submit a Claim, Speak with an Expert, Get Help Now or perform other essential functions. Immediately after launch, SPECS needed to prepare for incoming claims after the Fort McMurray disaster, a wildfire that destroyed more than 1,900 square miles of nearly everything in its path. LW helped set up several case study resources in both English and French, which would be helpful for existing clients and used to attract new ones.